Carrots and red bell peppers provide the antioxidants your body needs to protect vision health. Whether walking your dog or lounging poolside, you protect those baby blues (or browns, or greens) from the sun’s harsh ultraviolet rays with sunglasses that are as practical as they are stylish. But while the best aviator shades may help block up to 99 percent of UV rays, it’s just as important to protect your vision from the inside out. Your eyes also need a variety of antioxidants from a balanced diet to fight off free radical damage from the sun. Keep reading to learn which antioxidant-rich foods will help your eyes stay healthy all year long! If you were like most kids, your mom or dad may have endlessly urged you to eat your carrots. (That’s why you found them stuffed in your school lunch bag everyday.) But while you may have been sick of eating “rabbit food” as a youth, it turns out your parents were right! Carrots are nutritious little nuggets of goodness made to protect your eyes, so it’s time to give them a second chance. Just three large carrots contain double your recommended daily intake of vitamin A, a critical nutrient for healthy vision, according to the U.S. Department of Agriculture’s Nutrient Database. Carrots also contain beta carotene, which not only provides their orange color but also plays an important role in preventing age-related eye diseases. Other eye-healthy nutrients in carrots include vitamins C and E, riboflavin (vitamin B2), zinc, and lutein and zeaxanthin – phytonutrients that filter out harmful blue light and maintain cell health. But you don’t just have to eat them raw. 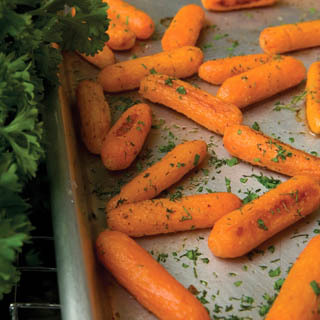 Try this roasted carrot recipe, flavored with fresh dill and parsley. It pairs well with beef or salmon as a side dish for your next meal. One of the most important antioxidants found in kale, vitamin C, slows age-related macular degeneration – the leading cause of vision loss in people age 50 and older, according to the American Optometric Association. Vitamin C is also found in oranges and apples, if you prefer sweeter foods. 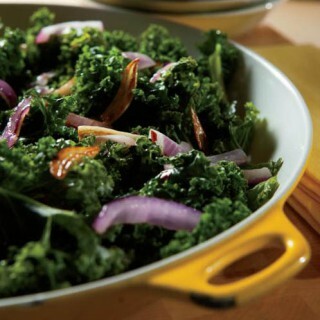 And if you’re not a fan of kale due to its tough texture, try this sautéed kale and garlic recipe. The tender, slightly spiced side dish is delicious and nutritious. Bonus: Garlic reinforces a healthy immune system. See Also: What Is the Most Popular Food in the World? Exposure to UV rays and chronic stress can damage healthy tissue – including in the eyes. Vitamin E, found in spinach, nuts and sweet potatoes, has antioxidants to protect healthy vision. One of the joys of shopping for produce from local farmers is trying fresh seasonal foods. 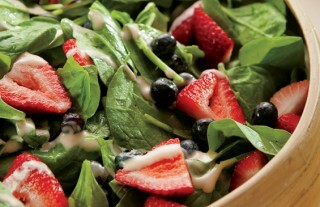 During warmer weather, pick up a bunch of raw spinach, take your family strawberry picking, and then have your kids help you make this summer spinach salad recipe. Red bell peppers contain 190 mg of vitamin C – nearly triple the amount in an orange! Not only are they an easy-to-eat snack (just wash, slice and enjoy), but red peppers are also a great source of vitamin A, vitamin E and other nutrients that promote vision health. 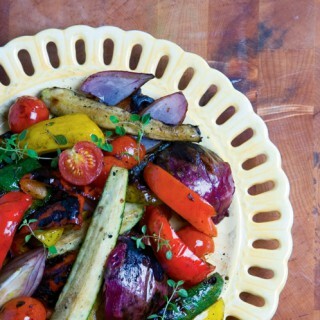 The next time you get out your grill, try this recipe for fire-roasted balsamic vegetables, featuring red bell peppers, zucchini, red onion and cherry tomatoes. You’ll definitely come back for seconds! Just 3 ounces of salmon contains 2.5g of omega-3 fatty acids and the antioxidant astaxanthin, which gives the fish its pink color and protects the retina of the eye. Other eye-healthy nutrients in salmon include vitamins A and E, riboflavin, lutein, zeaxanthin and zinc, which are also available in dietary supplements if you don’t eat seafood. Keep in mind, the right seasoning will make fresh salmon taste great – even to picky eaters! So satiate your hunger and get your daily dose of omega-3s with salmon filets topped with easy-to-make peach chutney. One whole sweet potato contains nearly double your recommended daily intake of vitamin A, as well as eight other eye-healthy nutrients. If you love traditional mashed potatoes but need a healthier alternative, give it a twist with this recipe for rustic mashed sweet potatoes. All you need is garlic, milk, butter and pepper, and 25 minutes to prep and cook this delicious dish. Cows provide much more than nutritious milk for your diet. They also provide vital protein, vitamins and minerals such as zinc for vision health. Just 3 ounces of beef chuck roast contains half your daily recommended intake of zinc. Other eye-healthy nutrients in beef – especially beef liver – include vitamins A, C and E, beta carotene and many other important nutrients. For hungry kids and adults alike, a protein and antioxidant-rich snack like this recipe for easy beef meatballs is a must-have. Grab them on the go, or toss them on top of pasta with fresh tomatoes. The magic is in the flavorful Worcestershire sauce. There’s a good reason to start your day with eggs for breakfast. Eggs contain a wealth of nutrients, including vitamins A and E, riboflavin, zinc, astaxanthin, lutein, zeaxanthin, and omega-3 fatty acids, to protect you from cataracts and other chronic eye diseases. If you’re short on time or need a quick meal to feed hungry friends and family visiting from out of town, this hearty spinach quiche recipe, featuring eggs, spinach, fresh mushrooms, and cheddar and feta cheeses, can be prepared in advance and enjoyed any time of day. A powerhouse of nutrients for vision health, fortified milk contains vitamins A and E, beta carotene, zinc, riboflavin (vitamin B2) and omega-3 fatty acids – all crucial in keeping eyes healthy. Add a splash of milk to a bowl of steel-cut oats for extra calcium and antioxidant support, or to make a wholesome, warm porridge. In the mood for a refreshing, seasonal dessert? Try this recipe for strawberry cheesecake milkshakes, and be sure to share! It makes enough for four small milkshakes. You can find all of the antioxidant-rich, eye-healthy foods mentioned above at local farmers markets, health food stores, grocery stores and anywhere certified organic produce, grass-fed meat and wild-caught fish can be purchased. Which recipe will you try next? Happy eating! Shop Green A green kitchen starts with environmentally-friendly shopping. To reduce plastic waste, keep reusable shopping bags in your car so you always have them with you. 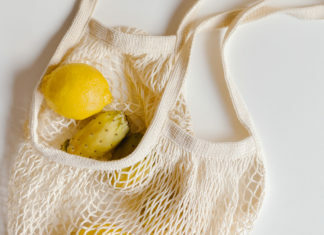 Also, consider replacing plastic produce bags with reusable mesh or net bags. See Also: What is Aquaculture?